A set of ten Country French solid oak dining chairs were carved with graceful curves and shell motifs about 50 years ago. Made by famous maker, "Councill," signature labels were lost when reupholstered. The restored deep finish has subtle "distressing" and is in excellent condition on this American made vintage furniture. Frames are tight and strong, reglued to serve another generation. Comfortably padded with new upholstery, the maker's signature has been lost. 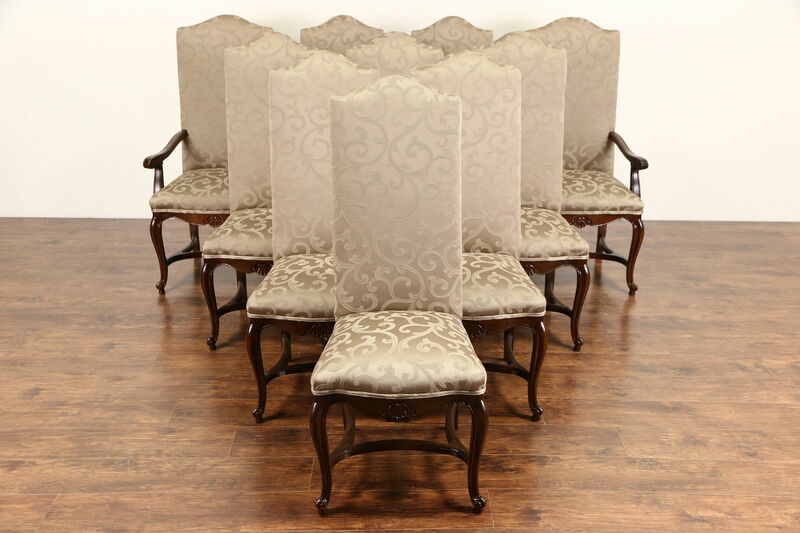 Two armchairs measure 24" wide, 26" deep, 46" tall and seats are 18" high, eight side chairs are 20" wide and 25" deep.